The second of my tasting reviews, where we will assess the outcome of last weekends roast. I’m looking forward to seeing how this African variety fares. The quote above and image to the right provide a hint of what is to come in the review below. What – Ethiopian Sidamo Special Process Unwashed Gr 4. 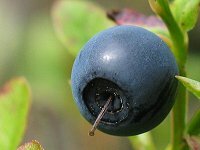 Assessment – Dry aroma: Face first into a blueberry patch. There is no other way to describe this. Begins on opening the cupboard and continues through to grinding the dose. The blueberries just keep on coming. Milk course: The smooth blueberry tones remain, with addition to the sweetness from the milk; medium body and could probably be described as a milder brew when consumed with milk. A hint of chocolate comes through on the finish. Aeropress: Medium acidity, smooth body, with a hit of blueberries early on whereas a little short on finish. Definitely an overarching blueberry flavour here, though probably lacks a little of the broadness of flavour and depth of sweetness in say, an Ethiopian Harrar. This bean variety is great value and certainly does not disappoint. As expected, a deliciously fruity variety on a backbone of blueberry, with a hint of chocolate for good measure. Works well in a milk drink however leans towards greater things when brewed in the Aeropress, allowed to cool a little, and consumed on its own. At its best about 4–5 days after roasting.